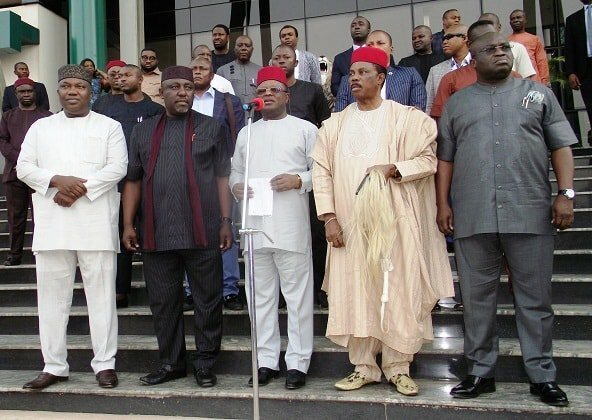 The South-East and South-South Governors’ Forum on Monday called on the ​Buhari government to increase allocation to the states from the Federation Account. The governors made the call in a communiqué at the end of the forum’s meeting in Uyo. ​The​ communiqué signed by its Chairman, Governor Udom Emmanuel of Akwa Ibom, expressed concern that in spite of increase in oil price and production level, revenue accruing to states had not reflected such realities. “The forum therefore urges the Federal Government to ensure improved revenue allocation to the states to reflect the current realities to enable the states meet the yearnings and expectations of their people. “The forum also proposed that the Federal Government should relinquish all federal roads​ ​to states, where such roads are located, facilitate legislation that would ease concession of the roads​”. The governors appealed for current intervention on critical infrastructure located in the South-South and South-East​, including​ airports in Calabar, Enugu, Imo and Port Harcourt as well as roads in the zones. The forum expressed concern over alleged shoddy approach to infrastructural development by some intervention agencies of the Federal Government operating in the regions. It, therefore, appealed to the Federal Government to direct the agencies to liaise with state governments in the identification and execution of projects. It expressed belief that the approach would ensure that projects carried out by intervention agencies were in synergy with the developmental agenda of the states. 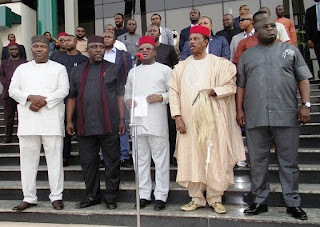 The meeting was also attended by Rochas Okorocha of Imo, Nyesom Wike of Rivers, Seriake Dickson of Bayelsa and Ifeanyi Ugwuanyi of Enugu. Others were Ifeanyi Okowa of Delta, Okezie Ikpeazu of Abia, Ivara Esu and Dr Nkem Okeke, both Deputy Governors of Cross River and Anambra.